Not everyone has a large backyard, let alone any backyard. 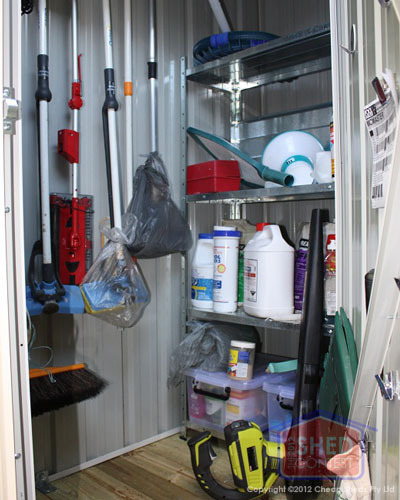 However, we all have storage needs whether it's garden or potting tools, cleaning equipment or just an overflow from the home. Sometimes all we need is a slim shed to tuck away around the corner. 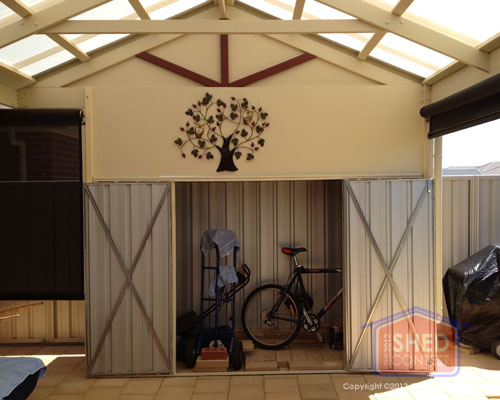 "Below you will find many stories and reviews sent in from our Cheap Sheds customers who love their slim garden sheds. 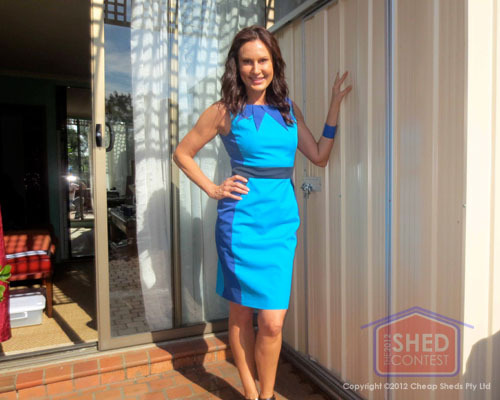 Hi, I love my slim line shed as it fits right under the eaves at the back of my house, which just happens to be in the pergola. It is stylish and the colour is great. 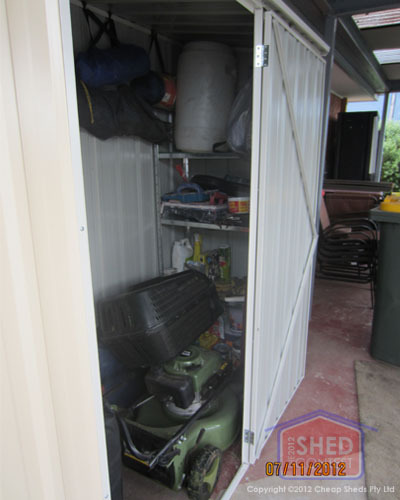 It doesn't take up a great deal of room but holds heaps of stuff (the lawn mower and other gardening equipment and also all the camping gear) that wouldn't fit in our big shed that is my husbands workshop and garage which holds his 1962 ek Holden. It was child‟s play to put up and the roof is even strong enough to hold a rather heavy wooden ladder on the top between the roof and the eaves of the house. So all in all a great rounder. 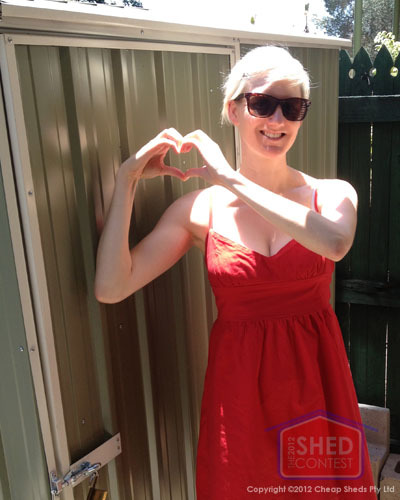 Thanks heaps Cheap Sheds. 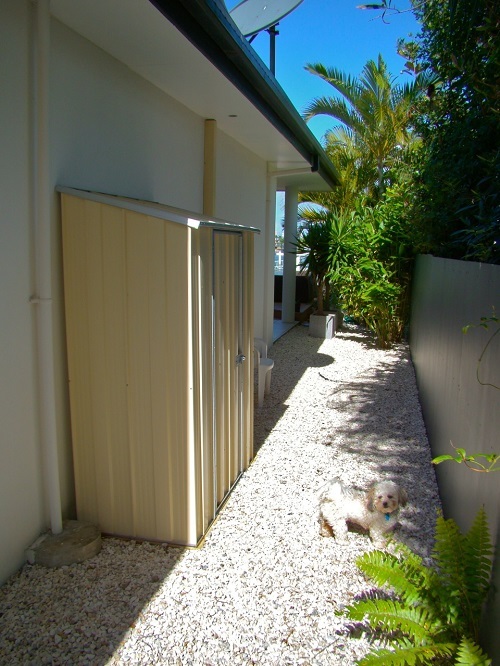 Having a home with a water frontage on the Sunshine Coast, we have a lot of outdoor furniture. This furniture has many large cushions. We don‟t want to leave these cushions out in the weather when not being used. 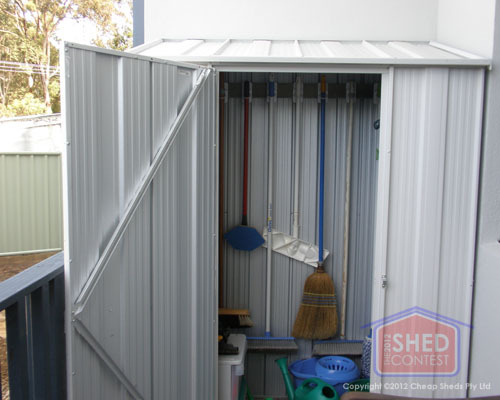 I looked at many storage solutions before deciding on a small shed. 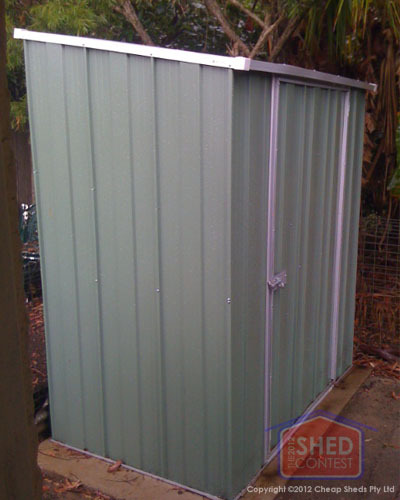 I searched the web and found Cheap Sheds. 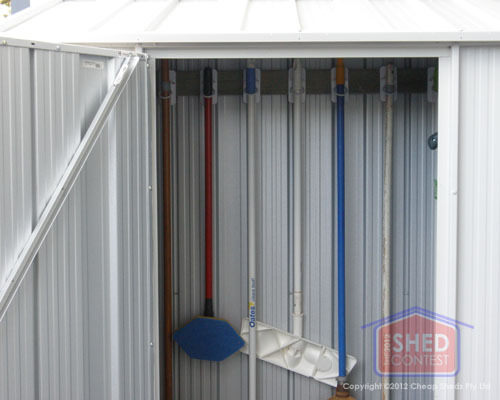 They offered a large range of shed sizes at the best prices. I ordered the size shed I felt was best for my requirement. Some days later I picked it up at a local depot and soon had it built. The instructions were extremely easy to follow and I thoroughly enjoyed the experience of putting it together. It is now over six months since it was built and it perfectly satisfies our storage requirement. 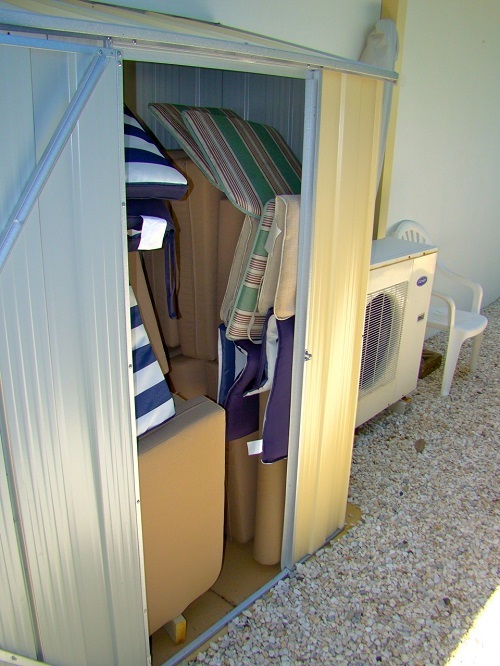 This shed provides easy access, keeps the cushions out of all weather and out of sight. What‟s more it looks good. We are amazed on how he can tell when the shed is open he is a good old fella. We needed some garden storage space but have a small back yard. 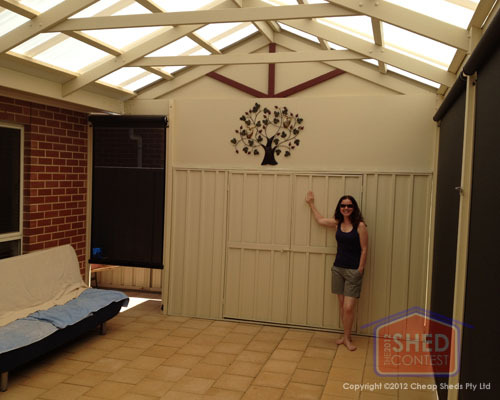 After building a pergola we wanted to make it weatherproof - so as well as blinds, we bought a shed from cheapsheds.com.au to form one boundary of the pergola. 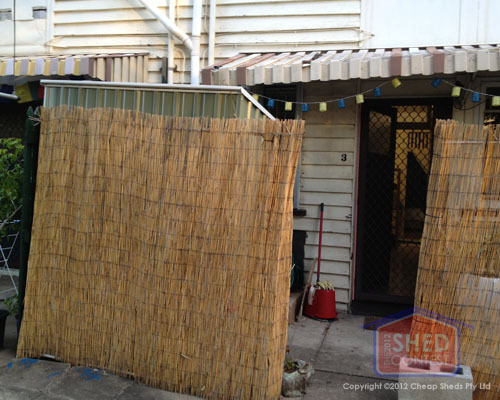 We filled in the gap above the shed and added a decorative hanging so it still looked great! 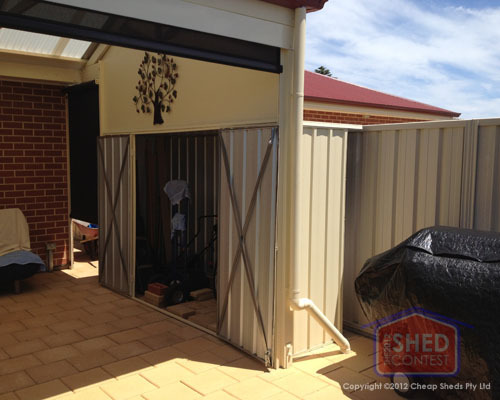 Now we have an enclosed pergola AND storage shed without taking up any more valuable space! We just love our shed!! Living in a small apartment, it gives us all the extra storage space we need. One of its more important purposes, perhaps not what it was designed for, is holding our fence up!! Also, we were lucky enough to get a 'spare' sheet which we screwed to our wall to cover some missing wood panels...at least, we hope it was a spare, or else we didn't put it together right...either way, it's fab! 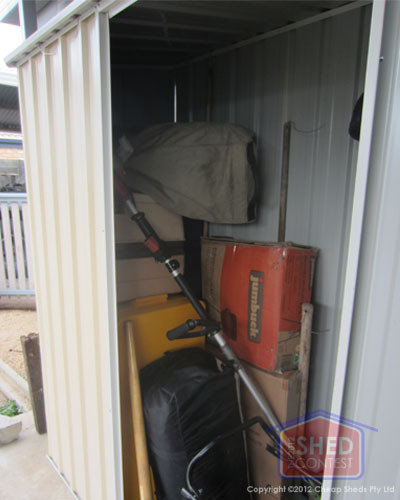 We were pretty keen to get a new shed, we had a fair bit of sports and adventure gear to store through the varying seasons of non-use and so we had affectionately called it the Adventure shed. It has a cool flat roof that so we can house the kayaks and surf boards on it. And there‟s lots of dry inside space for bicycles, life vests, fishing gear, scuba gear and other fun things. It did take us a while to get around to constructing it, but when we did it turned out to be a real breeze. And it only took about 20 minutes for Betty the cat to find it and claim it as her own. We haven‟t the heart to take it away from her just yet; so for now she gets to use it as a second home. 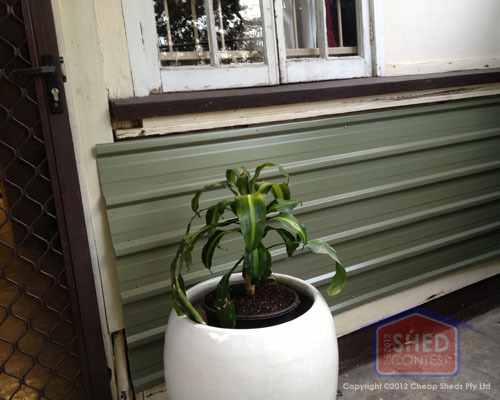 it fits perfectly into the space at the end of the back verandah of our new house at Moruya Heads. My clever husband (pictured) found it easy to assemble and as you can see by the photos, we have painted it the same colour as the house exterior wall, so it blends in and is unobtrusive. it is flexible in it's use and has solved a major space problem. We did not have sufficient broom cupboard space in the house, so the shed has become our spacious, well organised, easy-to-use broom cupboard. I have built terraced planter beds down the side of my house, and wanted my gardening tools and supplies to be located nearby rather than in the garage on the other side of the house. 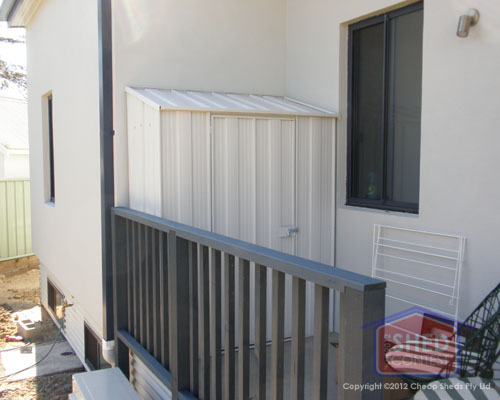 The storage system or sheds needed to fit in a 800mm wide space to maintain the pathway access be able to stand on a timber platform, and not be an eyesore for the neighbors looking out their kitchen window. 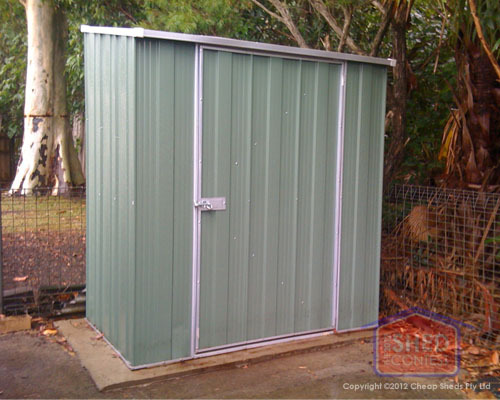 I was very pleased to find Cheap Sheds Townhouse 2.2 x 0.6 garden colorbond sheds. It is a perfect fit for the space, and was available in a light brown, which blends in well with the brickwork behind it. 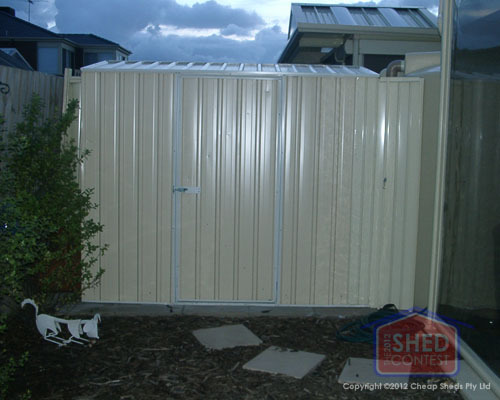 Compared with other companies, Cheap Sheds were the cheapest and offered prompt delivery. Krisztian was very helpful answering all of my emailed queries prior to my purchase. I started assembling it on Saturday morning and had it erected and full by Saturday afternoon. The clip-in sheets and step-by-step instructions made it an easy 1-man job. The double doors are ideal for easy access to grab anything from the shelves inside, while standing outside. 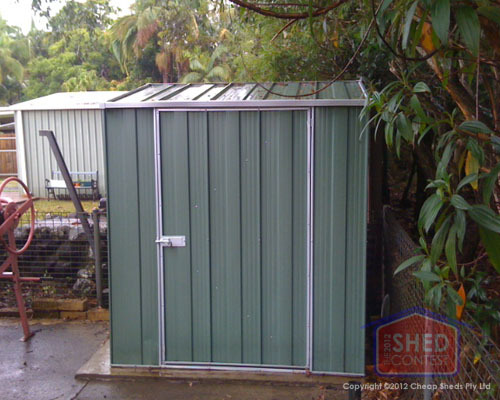 I have already recommended Cheap Sheds to two friends, and will continue to do so. We had just moved into a retirement village and wanted a place to store the tools. 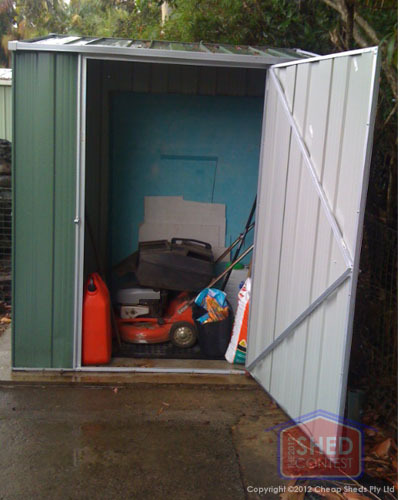 This shed was the largest available to fit the limited space. I was fortunate to get some left over panel from the pergola installers to fit on the side of the shed to cover the overflow pipe from the tank, so that it all blends in together. It also allows for a catch to keep the door open. Looking at the left-hand side of the shed you can just see the side fence, noting that the shed is just above the fence. Now thinking the position was reasonably safe, I only used small screws into the pavers. But the wind picked up and the shed fell over, hence the dent on the lefthand side about 3/4 the way up. After I stood the shed back up I went around and more and larger screws into the pavers. I also took advantage of the guys when the pergola was being erected to put a silicone strip all around the inside. I also used some packet cement to fill the gaps of the pavers. If you look carefully you will notice the paver on the left-hand side dips a bit. It was fine initially but it was too hard to level it again trying to maneuver the shed around after it had blown over to re-level the pavers. I did try my best, but it is difficult doing everything by yourself because the wife has spastic diplegia. The added section in front to cover the downpipe allowed me to put a doorstop on this section. The white statue dog is in memory of our previous dog. My shed from Cheap sheds in August 2012 was a most valuable purchase; I had a rear walkway that was a mess: 20 nails along the wall held mops, brooms, brushes, dust pans, pool skimmer, gardening tools, hats, etc. etc. This was also an open storage area for pool chemicals, seed trays, fertilizers, watering can, leaf-blower, etc. „Vogue‟ or „House & Garden‟ editors would have been appalled! 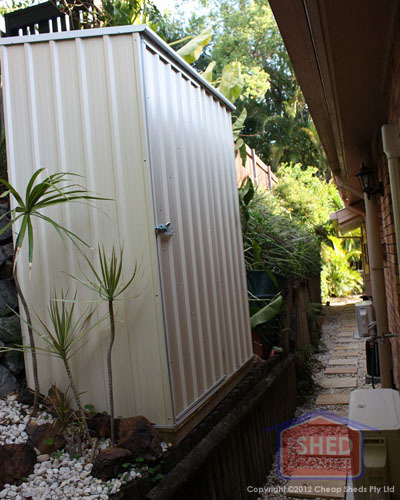 On the face of it, there was no room for a shed; however it was seen that by leveling a neglected 'wasted area' above the walkway, a standard sized shed could be squeezed in. Due to the narrow walkway, it was decided that this would be unconventional: the new foundation would be at hip-height. Overgrown tangled ferns were cleared, and a site leveled. 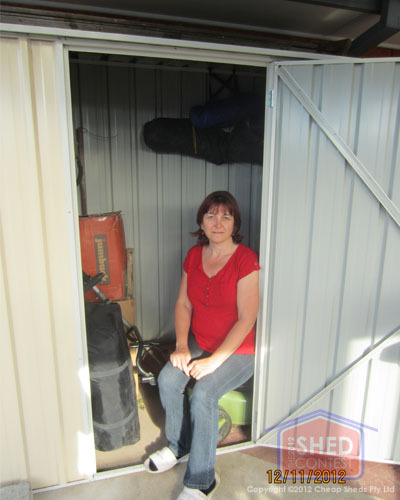 The shed was ordered through the Internet, and collected from Acacia Ridge. Assembly was a breeze: all parts were well labeled, and connected by simple screws. Although this would have been easier to assemble with a helper, it did not take me too long to finish the job. The extra timber floor, also easy to assemble, was precision-cut, created a firm base, and avoided the mess of making a concrete slab. Assembly took less than a morning. I added steel shelves from a hardware store, and included a number of hooks either screwed in, stuck on, or magnetic. After relocating all the junk along the walkway, and noting the smooth opening and closing of the steel door, I needed only some 'instant' pebble landscaping to finish off a well-positioned and extremely useful garden shed. 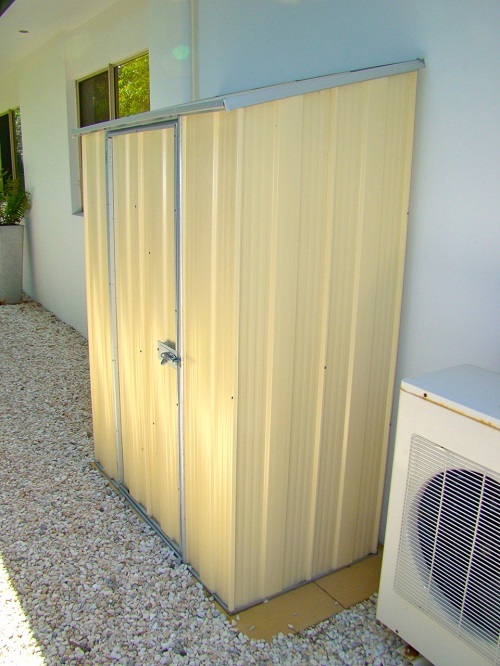 This made the walkway an attractive feature of the landscaping all contents of the shed are now well ordered, and easily accessed and replaced by simply reaching in at waist height. 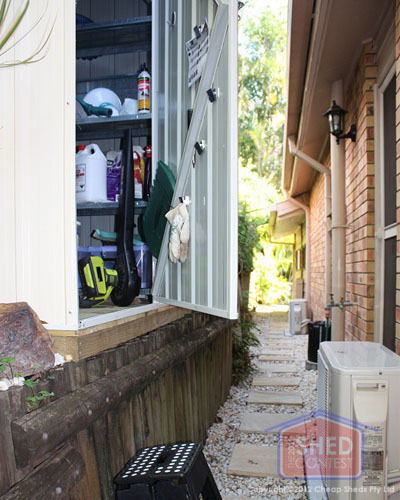 A folding footstep gives full access to the shed if necessary. 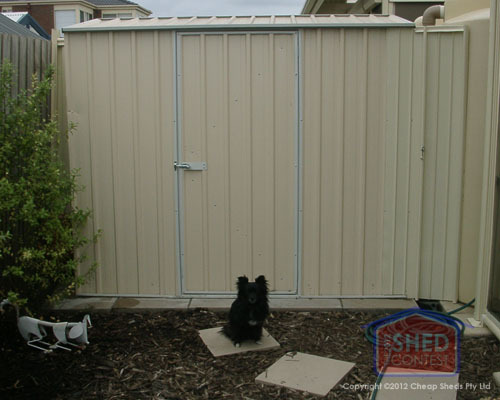 Why didn't we get one of your Cheap sheds years ago? It has made such a difference! 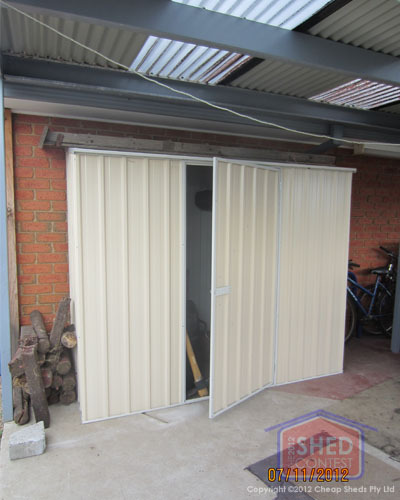 Finding the right shed doesn't have to be Secret Men's Business. 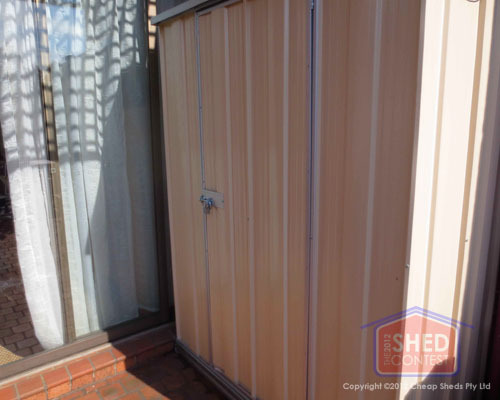 It was a tough call to create storage in a three-bedroom apartment on the second floor of a building in inner Sydney. There was a small irregular-shaped space on the deck tucked away out of sight in the shade. It was a bit of a dead zone. Be a great colour that wouldn't make the corner of the deck any darker or somber. 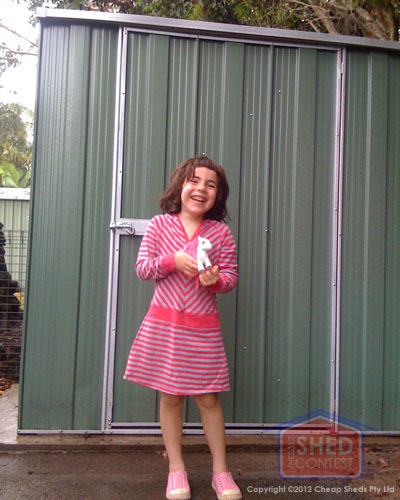 I was thrilled to find a cost effective shed that ticked this long list of requirements and was quick to assemble. 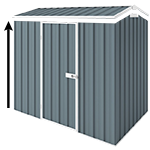 The customer service at Cheap Sheds was superb and it's easy to recommend this great business to friends and colleagues. Thanks again for a perfect solution to a tricky challenge. 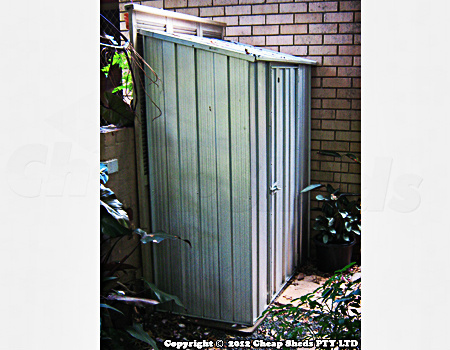 Searching the net I discovered Cheapsheds.com.au easily had the best deals on all types of sheds. I got a free upgrade to Colourbond, which was incredible value! After laying the slab, assembly was a breeze - only took a couple of hours to have it up & ready. Instructions were well laid out and easy to follow. Krisztian and the team deserve 5 stars for their commitment to customer satisfaction & service as well as incredible dedication to providing excellent value shed deals. I have been telling anyone who‟ll listen that the best deals are available from them. Thanks Cheap sheds! See Picture with my 4-year-old Daughter Luka. Having spent 15 years living in London flats, our Cheap Sheds is our first ever shed. It may not be big & flash like next door‟s, but it does the job fitting in our DIY gear, garden tools and other bits and pieces. 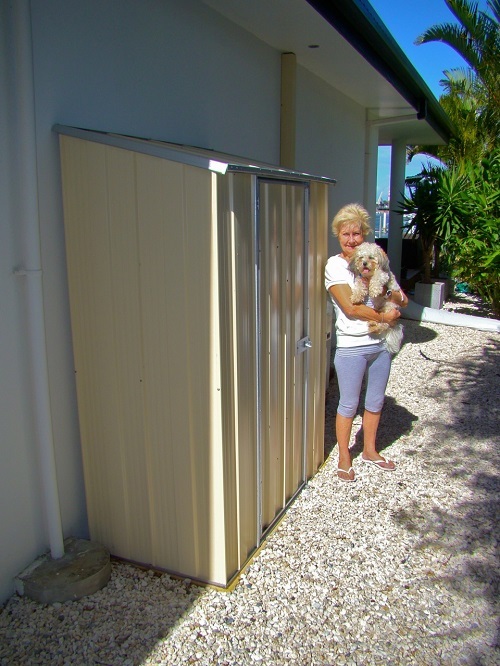 There‟s also pride in knowing that we put up the shed ourselves – despite our DIY skills largely being limited to painting and putting together flat pack furniture. My sister and I did have a few issues putting the sheds together, not because of the shed itself but due to our own lack of ability. We even managed to partially erect the shed around a pergola post. I love my sister dearly, but even she‟d admit that when it comes to putting things together she‟s about as much use as a chocolate teapot. Mind you – she does love chocolate and a nice cup of tea. Still, we got there in the end and our shed is a well used and loved addition to the house. 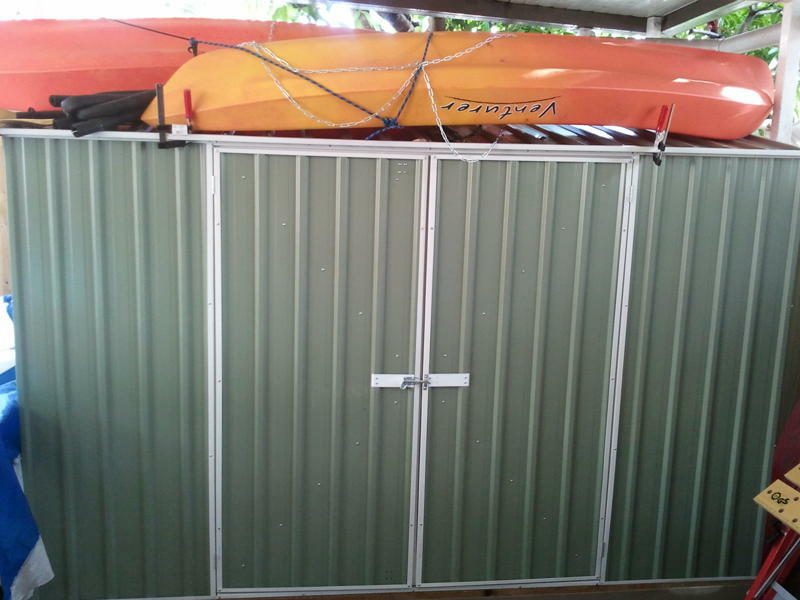 It‟s not a workshop, studio or a man cave, it‟s just a small shed – but I feel pride whenever I look at it knowing that I managed to put it up largely on my own – with some small assistance from my sister. Anyway, surely it‟s not the size that matters, it‟s what you do with it and our shed suits us fine. 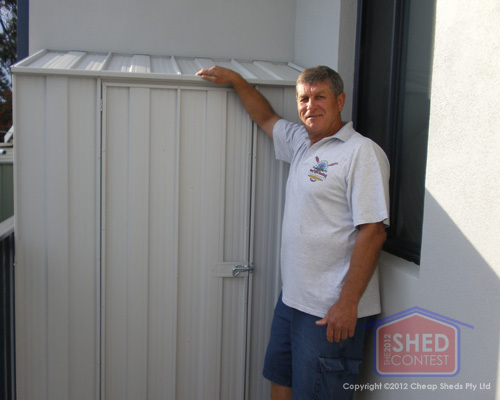 Check out what Paul had to say about his Shed he purchased at Cheap Sheds. Thank you for the great feedback Paul. We appreciate it more than you! Andrews’s story below is common amongst cheap shed customers. 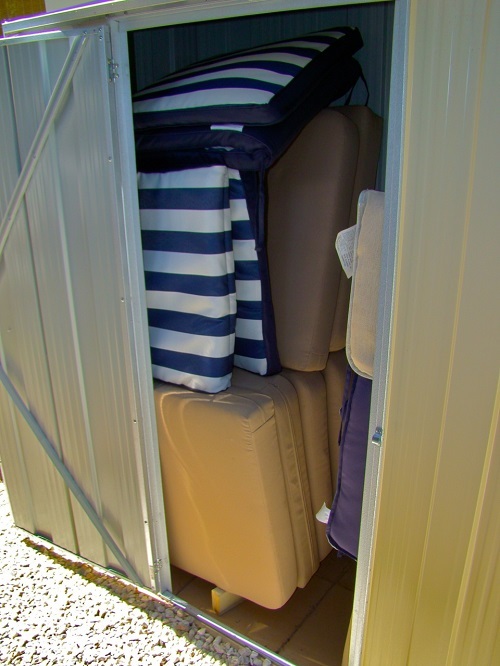 Everyday people looking for a storage solution who don’t have a lot of room i.e. no big backyards. Watch this short video where Andrew explains just how easy it was for him to buy and assemble his shed. It’s been a while, greetings Krisz and after all that rain finally got the shed up; see pic attached! Best wishes, Daniel. 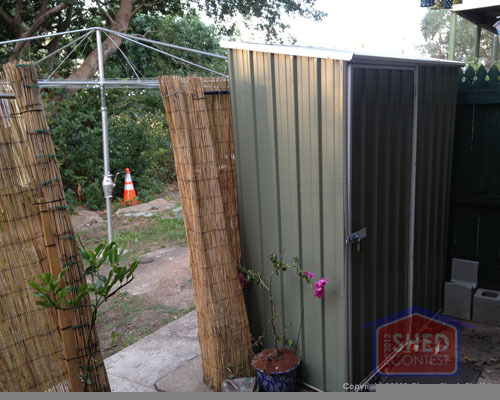 Brisbane local Luke Stockley is ‘stoked’ with his shed. He loves it that much he’s got his very own guard dog to keep an eye on it.